We are a two income household. We try to live on my income and save my wife’s income. We’re looking to max our individual retirement accounts for the first time this year. We maxed our Roth accounts early this year, and will max our 401K next month. In all fairness, this is only the third year where one of us have had a 401k account. We make average salaries (we are a regular office dweller and a nurse, in a fairly expensive city). So meeting all expenses on one salary is not feasible every month. We also make generous gifts to our families. Setting a savings goal at the beginning of the year has helped us stay in line. We’ve completed 80% of our goal so far and are likely to surpass it by year end. We plan to continue funding half of our investable income into our emergency reserves (VMMXX) and the other half in VTSAX (and VYM). We want to “always be investing“, while also ensuring we don’t have to sell those should the economy turn south. We also want our emergency fund as a down payment on a rental property if, when the economy turns, we’re both holding on to our jobs (and are relatively comfortable) and property prices fall. Our Stock to Bond split remains unchanged at an aggressive 80% to 10% of our net worth. 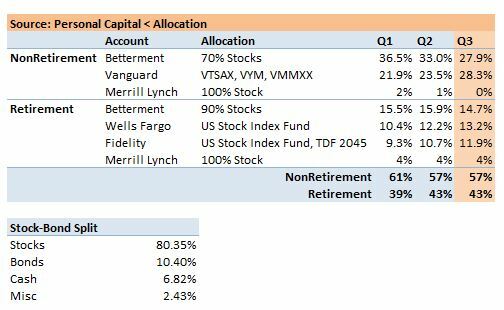 Almost all our funds are now in low cost index funds – see Vanguard and Betterment allocations below. This entry was posted in FI on October 1, 2018 by gofi.